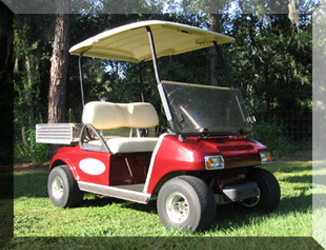 Call today for a free quote on a CUSTOM CART! Home | Classic Carts | Exotic Carts | Carts Available Now! Some of our Custom Club Cars Available Now! 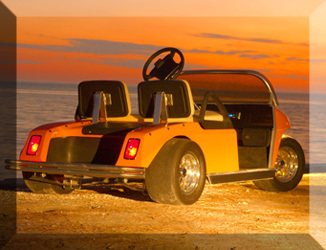 New design for custom golf carts—the Street Rod! Club Car lowered with slicks! Custom paint, CD player, custom lights. High speed electric 48volt motor. Custom woodgrain dash, lights, mag wheels, tires, diamond-plate utility box, batteries, charger, body —ALL OF THESE ITEMS ARE BRAND NEW!